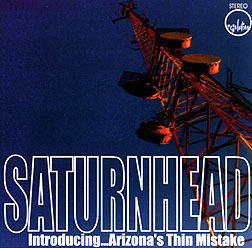 CD Review: Saturnhead, "Introducing...Arizona's Thin Mistake"
Sometimes reviewing music is a bit like being a patron at Bob's Country Bunker -- you hate a band so much you want to hurl beer bottles at 'em, you like a band so much... er, you want to hurl beer bottles at 'em. And, not unlike the Blues Brothers, Saturnhead is one of those bands that covers both bases at the same time. Terry Miles, taking time off from Cinnamon and playing pretty much everything on this 43-track (!) CD, is apparently influenced by both Rob Pollard and Tobin Sprout -- at the same time, too! Introducing... is an album so like Guided by Voices' Bee Thousand that even GBV would be hard pressed to duplicate it. Listen to the title track, "Hail the Beekeepers" or "A Post-Aristocratic Theme Song," and you'll realize that Miles may be more than a little obsessed with GBV. In itself, being this derivative would constitute enough reason for a lynching, but, in Saturnhead's case, Miles apparently doesn't just know what makes GBV sound the way they do, but also he knows what makes them sound so damn good. And we're even treated to Miles' impression of GBV's impressions of Boston ("Man the Stations"), Mott the Hoople ("The Only One") and Beck ("Orwellian Rap"). So you're bound to hate Saturnhead for ripping off Guided by Voices, and you'll love them for sounding this good [ed. on CD, at least] in the process. Either way, Saturnhead is going to end up ankle-deep in broken glass.